Back in 1999’ish I heard the name Owsley on the XTC Chalkhills mailing list. I bought the album based purely on that recommendation. For the definition of ‘power pop’ look up this debut album. The guitars are purposeful, the lyrics straightforward, the vibe energetic and direct. 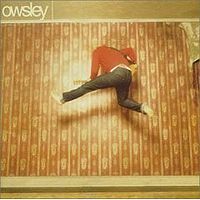 Owsley is the debut album by American singer-songwriter Owsley, released on Giant Records in 1999. Born and raised in a richly musical family, Owsley spent a majority of his childhood working as an unpaid roadie for his brother’s rock band and playing guitar along with the radio to such bands as Wings, KISS, and The Cars. While touring the southeastern USA with different cover bands, Owsley was introduced to funk-pop pioneer Judson Spence with whom he played around the world, both literally and virtually, by appearing on MTV in Spence’s videos. Owsley then met another talented artist by the name of Ben Folds, who introduced him to Millard Powers. Millard and Owsley formed a band called The Semantics (featuring Zak Starkey) that would eventually dissolve, with each band member musically going his own way. Jaded by the break up of his band, and disillusioned with the notion of fronting a band, Owsley opted to relax a little and accepted an offer to play guitar in Amy Grant’s touring band. This allowed him the financial freedom to pursue his own music and invest in a home studio where he recorded this album. Owsley next crossed paths with legendary producer Mutt Lange, who hired him to play guitar and sing duets with Lange’s wife Shania Twain on several nationally broadcast television shows. After two long years of recording, Owsley emerged with his eponymous, solo debut. Recalls Owsley, “I had heard the story of Tom Scholz of the band Boston recording his first album and taking it to the record company, where he told them that it was finished and they could take it or leave it. And I thought, ‘What a cool idea!’ I didn’t want anyone else coming between me and what I was trying to accomplish.” The critically acclaimed record was released by Giant Records in 1999 and was nominated for a Grammy in 2000 for ‘Best Engineered Album’. 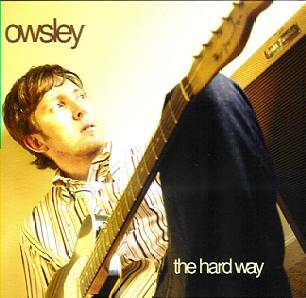 While doing a little searching for forgotten details about Owsley I discovered that there was a follow-up album “The Hard Way” in 2003. I’m going to buy it but for now I’ve managed to get a copy to listen to. Seems he’s still on the road with Amy Grant , looks like a good deal to me – he plays for a living and then gets to record his own music when the opportunity arises.